You know the saying, “ask and ye shall receive?” It really works! In yesterday’s post Study Finds Solo Lawyers Bill Only Two Hours A Day, I questioned the results of a “Legal Trends Study” announced at the recent Clio Cloud Conference that showed that solos use only a tiny fraction of the workday for work (2 hours) and of that time, spend 1.76 hours on billable work and only collect 1.6 hours of the time billed. I acknowledged that the full report had not yet been released and therefore, I might be “jumping the gun” with my criticisms but I felt that the issues that the story raised – how we use data and the importance of context – were important enough to start a dialogue. And indeed, that’s what I’ve done. Since my post, I’ve received some positive feedback as well as some criticism from Clio officials on Twitter for errors in the post. Since some of these points are accurate, I wanted to update the post to make some clarifications. At the same time, I don’t apologize for it. As Carl Sagan said (h/t to a Solosez reader), “extraordinary claims require extraordinary evidence.” In other words, when a company, with great fanfare announces blockbuster results based on a data-driven study, it should be prepared to show the supporting data or risk a situation where someone might actually take issue with it. I did not listen to Jack Newton’s keynote speech announcing the results of the study because it was not online at the time. Instead, I relied on an ABA Journal article and Law Talk Network podcast with two Clio officials – both of which referenced the highlights of the talk. I did not contact anyone at Clio prior to writing my post because that’s not how I operate at MyShingle – I blog about many products and services and like many bloggers, rely on existing and credible news reports as my sources. In this case, I relied on stories from the ABA Journal and an interview with Clio officials, so it’s not as if my coverage was one-sided. That said, my blog is always open and those who don’t agree with posts are welcome to comment or submit a counter-post for publication. Although the Clio keynote speech still wasn’t online as of last evening (according to a Twitter exchange), a colleague of mine who had taped the keynote shared the link which I’ve since watched. After reviewing the keynote, I see that my claim that Clio “failed to that the low number of billable hours might have resulted from lack of work as well as inefficiencies” was incorrect. Although the media discussed only the inefficiency factor, Jack’s keynote did make clear that both factors (inefficiency and lack of work) account for the small fraction of billables. 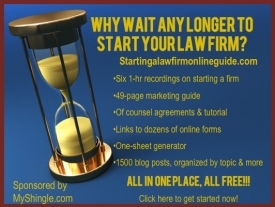 Several commenters to my post suggested that the Clio data was skewed because it did not account for flat fee arrangements where many lawyers enter “one” hour into Clio (for one flat fee task) or don’t run flat fee invoices through the system. On Twitter, @JoshuaLenon, Clio’s lawyer in residence explained that the the data segregated between flat fees and billable hour matters. As cloud-based systems amass more data, we will see these kinds of “data-driven trend reports” issue more frequently – and that data can play an important role shaping our firms, selecting practice areas or identifying potential client markets. My only point is that before relying on these numbers, we should understand the data and methodology behind them.